Text and photos by Mauricio Alvarez. We have chosen to publish this article in two parts to simplify your reading. The first was to recall the meaning of the word democracy and explain the root causes of the Yellow Vests movement. 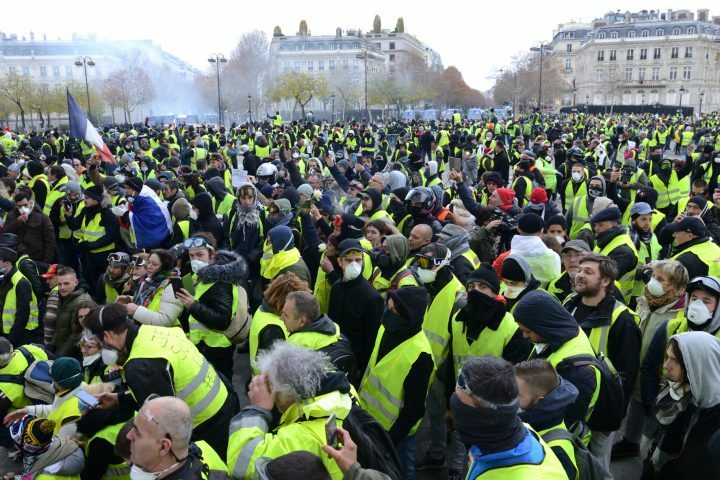 This second part focuses on the lessons to be learned from the way the Yellow Vests operate, the actions and the demands of the Yellow Vests that would enrich our Democracy. We also pose some questions that will have to be answered on the way to achieving such a Democracy. The organization of the Yellow Vests is horizontal. From the beginning, the members of the movement, spread throughout the country, avoided establishing hierarchical relationships. They do not talk about leaders or representatives, and prefer to talk about spokespersons. Anyone who tried to call themselves “Yellow Vests representative”, seeking personal (sometimes political) benefits, was quickly called to order. For them, every citizen has a say. This organisation makes it possible to avoid the formation of elites, which could eventually fall into a process of bourgeoisisation. This horizontality has been copiously criticised by many traditional structures (trade unions, media, government officials, etc.) who believe that no dialogue is possible without visible heads or representatives. There is a real unease in dealing with an anonymous mass (“the people”) who wish to have their rights respected. Would a true government of the people, by the people, for the people, need representivity? If the answer is yes, how should the possible representatives of the people be elected? Since the beginning of the movement, the Yellow Vests have been present throughout France. Organized in small groups, they decide, as they go along, and in an autonomous way, on the operations to be set up locally: blocking roads, blocking of service stations, “toll-free” operations, etc. They also decide on the operations to be implemented locally. This form of organization and governance has quickly made it possible to rebuild links, strengthen local solidarity and foster the political commitment of citizens throughout the country. What is the benchmark for democracy? The one that would allow citizens to feel that they are actors and responsible for the system? 3. In a democracy, there should be the possibility of revoking the mandate of an elected representative if their management is deemed unsatisfactory. In the street and in the media, the Yellow Vests are constantly calling for the immediate resignation of the President of the Republic Emmanuel Macron. Dissatisfied and directly affected by the measures taken since the beginning of his five-year period, they would like to have the possibility of revoking his mandate at any time. Some consider that no power should remain in the same hands for long: neither parliamentary, nor governmental, nor judicial, nor media. Is it necessary in a democracy to have a President of the Republic? Or would the role of the Prime Minister be sufficient to enforce the laws and decisions made by parliament and local elected officials? What would the conditions be for revoking the mandate of an elected representative before their term expires? Since the presidential and legislative elections, the President’s LREM party (French initials for “The Republic on the move!”) has always had an absolute or relative majority in the National Assembly. This means that legislative and executive roles are concentrated. We are therefore facing an “absolute” power. The Yellow Vests’ frustration is due in part to the violence of the government’s actions in record time. Unpopular laws, drafted, passed and enforced without major constraints, because the opposition is under-represented. Ideally, powers must be separated to be weakened. Power should work under the permanent control of citizens who are always the ultimate arbiter. The confusion of powers, like power without citizen control, legitimizes popular insurrection (*). How could we guarantee the complete separation of powers in our democracy? 5. In a democracy, a simple language should be used, understandable by all. The Yellow Vests, like most citizens, express themselves in a simple way. Their words are far removed from the technocratic discourses of the political elites. In recent days, France has witnessed a dialogue of the deaf in the press. To cries of despair from people no longer able to make ends meet, politicians respond with technical terms such as balanced budgets or government debt. Let us recall the importance of empathy, the ability to put oneself in another’s shoes in order to create constructive relationships and dialogues. Parties, not feeling listened to and understood, end up developing an atmosphere of mistrust and hatred, which often leads to violent demonstrations. This is indeed what is happening in France at the moment. The government responds to citizens’ requests with high security measures. For their part, citizens who have no other means of making their voices heard resort to violence. How can we avoid using violence to make our voices heard? The Yellow Vests movement was created and developed through the Internet. To make their voices heard, organize and gather, citizens have used computer tools to keep their hands on information. Faced with an unprecedented mobilization, the traditional media very quickly took up this subject, becoming a key relay to inform the entire population. The Yellow Vests, non-mobilized citizens, economic and political forces had the opportunity to express themselves freely on radio, television, print media and the Internet. In a global trend towards media privatization in which control of information is exercised by economic forces, the democratic state must ensure the existence of information sources that are both independent of political power and independent of economic forces. This necessary principle of independence applies not only to newspapers, radio and television, but also to polling and statistical institutions, as well as to any existing or future instrument for the mass dissemination of information (*). How could the State guarantee free information media, politically and economically?